While the construction of water and sanitation facilities in Langrug is difficult, it is not the fundamental challenge being faced. Rather, the maintenance and management of these facilities is a greater problem that needs to be addressed to achieve sustainability.In order to tackle the monumental challenge at hand, this project aims to explore the potential of different business models as a solution. The challenge with this model is securing funds to purchase inventory and to cover other expenses. The end goal of this project was to provide a sustainable model that will allow the Langrug facility, and others alike, to operate independently. In turn, the project could potentially also improve water and sanitation problems that have persisted. There are four main business strategies that were considered for this project: a small for-profit business, a co-op, a cost-savings group and a social enterprise. These four models are diverse in their management structures, formalization requirements, documentation requirements and expenditures.In order to determine which model, or combination, would be most suitable all four strategies were examined in detail in preparation of the teams’ arrival. Prior to selecting a model it was necessary for the team to preform an assessment of the current facility and its operations. The first model considered by the group was a small for profit business. In doing this, community members could run a business and see some personal and community reward. The group believed that this model could be a successful venture as the reward concept could illicit greater community involvement and motivation. The next strategy the team hoped to explore was a co-op. 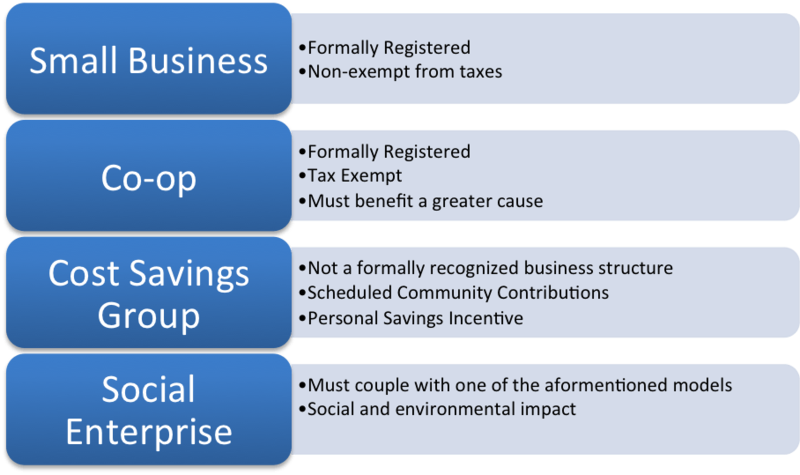 This model incorporates the idea of a small business yet ties in the concept of community benefit. The group researched this structure due to its high compatibility with the project. Although the model had been tried in previous project, the group still saw potential in this model as an appropriate solution. The third model the team considered was the cost-savings group. In this setup, the community members would be contributing to a mutual fund in order to finance the operations of the business. 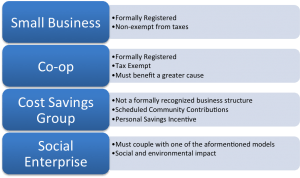 This method requires voluntary donations from the community, as it gains strength in the number of community member that are willing to contribute. The main setback with this model is asking community members to voluntarily contribute what little income they already have. The final model that was considered for this project is a social enterprise. In this model, the services produce a positive effect on the community through social and environmental impact.This project evaluates the social enterprise based on these criteria while considering the effects that the WaSH facility, as well HEW supplies, have on the community. A diagram explaining the four different business models investigated by our team. Ideally, any revenue generated from this small business would be used to maintain and manage the WaSH Facility, as well as to provide further benefits to the community. Additionally, this model would provide employment opportunities to increase community livelihood. The goal was to create an easily replicable model for facility management and operations. This model would then have the potential to be implemented in informal settlements throughout South Africa. The expansion of such a model would provide for improved livelihoods and living conditions for a much larger population.